↑ D. Cruikshank, ed. Sir Banister Fletcher's A History of Architecture, 20th edition 1996:873. 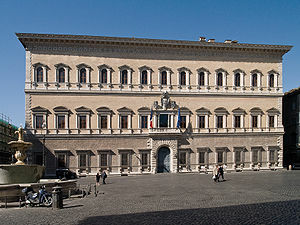 Satellite photo- The Palazzo Farnese is the massive, almost square, court-yarded structure in the center of the photo, to the North of the Tiber. The smaller bracket-shaped building southwest (lower) across the Tiber is the Villa Farnesina. หน้านี้แก้ไขล่าสุดเมื่อวันที่ 2 มิถุนายน 2557 เวลา 22:52 น.